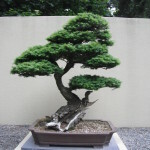 Names: The genus name “Tsuga” comes from Japanese words meaning “mother” and “tree.” The species name heterophylla, literally means different leaves. This refers to the different lengths of needles found along a branch. Hemlock trees are sometimes called “Hemlock Spruces” to differentiate them from the herbaceous Poison Hemlock, which is in the Parsley Family. Relationships: Of the 10 species of this genus, 6 are native to eastern Asia, and 2 to eastern North America. 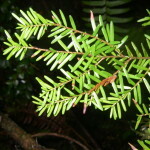 The Mountain Hemlock, Tsuga mertensiana, also occurs in our area mostly in the Mountains. Distribution: Western Hemlock occurs from the southern coast of Alaska to the northern coast of California and the Cascade Range of central Oregon. It also occurs in the Rocky Mountains of Canada, Montana and Idaho. 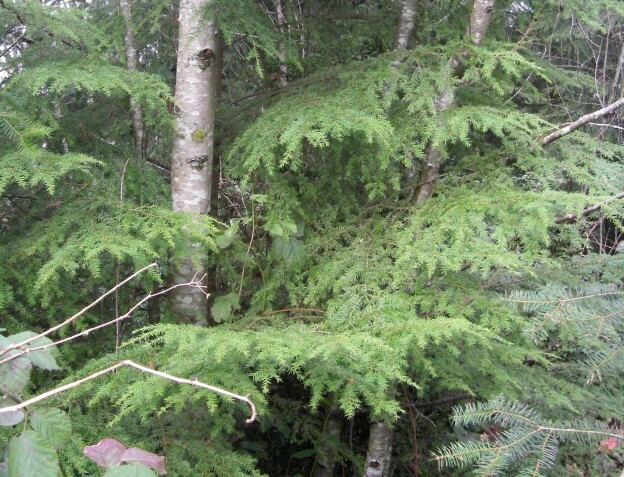 Western Hemlock is considered the climax species in most of our area. That means that, in theory, if forests are left alone and allowed to grow undisturbed indefinitely, Western Hemlock would be the dominant species. 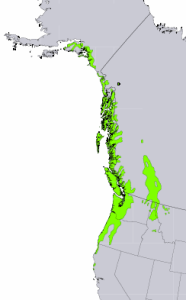 The Western Hemlock Ecological Zone extends from British Columbia through the Puget Sound Region south to Oregon where it splits along the Coast Ranges and Western Cascades. It is bounded by the Sitka Spruce Zone along the coast in the west and the Subalpine Zone in the Cascade Mountains in the east. Young Western Hemlock with a drooping leader. Growth: Western Hemlock typically grows 150-195 feet (45-60m). 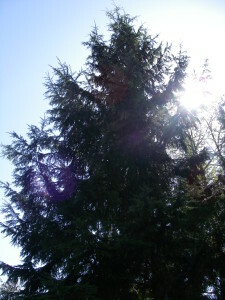 The tallest Western Hemlock is over 240 feet (73m) tall. The oldest are over 1200 years old. Habitat: Seedlings of Western Hemlock often begin life on the decaying wood of “nurse logs.” or stumps in the shade of Douglas Firs. They usually start out growing slowly in the shade, much faster in full sunlight when an event occurs that opens it up to the sun. By studying the different sizes of growth rings you can often tell when a tree was growing in shade vs. sun. It grows on fairly dry to wet sites and is very shade tolerant. Wetland designation: FACU-, Facultative upland, it usually occurs in non-wetlands. The different sized needles of Western Hemlock. 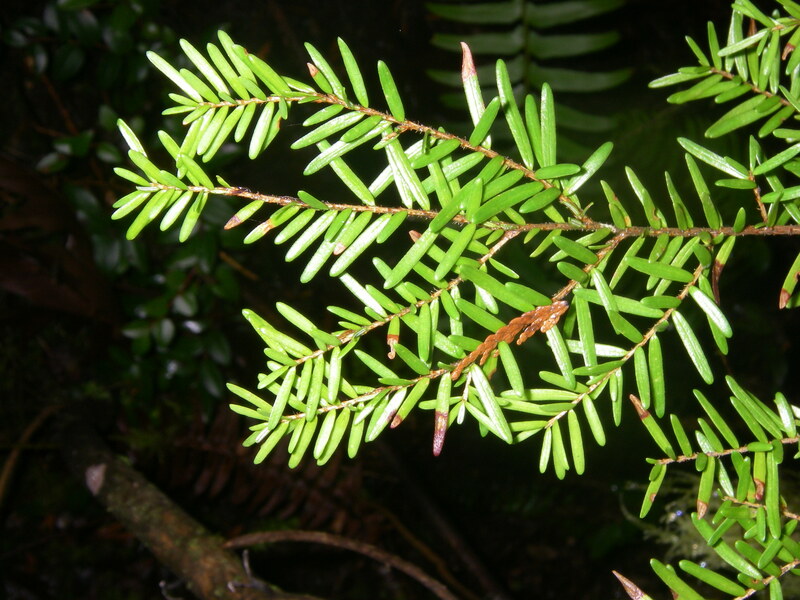 Diagnostic Characters: Western Hemlock is usually recognized by its drooping top and its different-sized needles in flat sprays. Its small, woody cones are usually less than an inch (2.5cm) long. In the Landscape: The fine textured, fern-like foliage of Western Hemlock gives it a graceful, delicate appearance. This beautiful tree can be grown singly, in drifts or used as a screen. Phenology: Bloom Period: Mid-spring –Mid-April is typical, but may range from March-June (earlier in southern coastal areas, later at high elevations, interior and northern stands). Cones begin to mature in August; seeds are fully ripe by mid to late September but cones do not open until October. 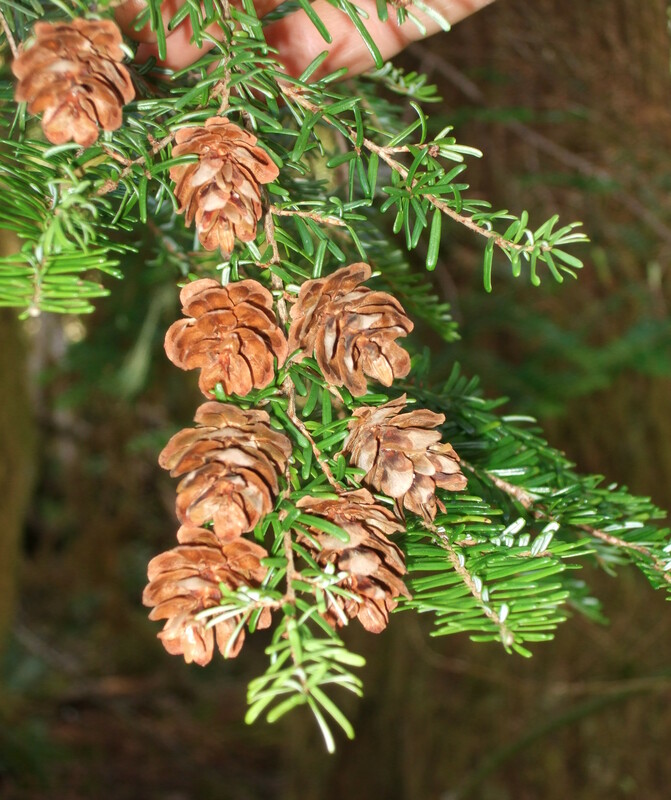 Propagation: For the best results, seeds of Western Hemlock should be stratified at 40ºF (4ºC) for 90 days. Sown seeds should not be covered; they germinate on the surface of the soil. Seed can be stored up to 5 years at 32ºF (0ºC). Propagation by cuttings is difficult but possible with hormone treatment, misting and bottom heat. 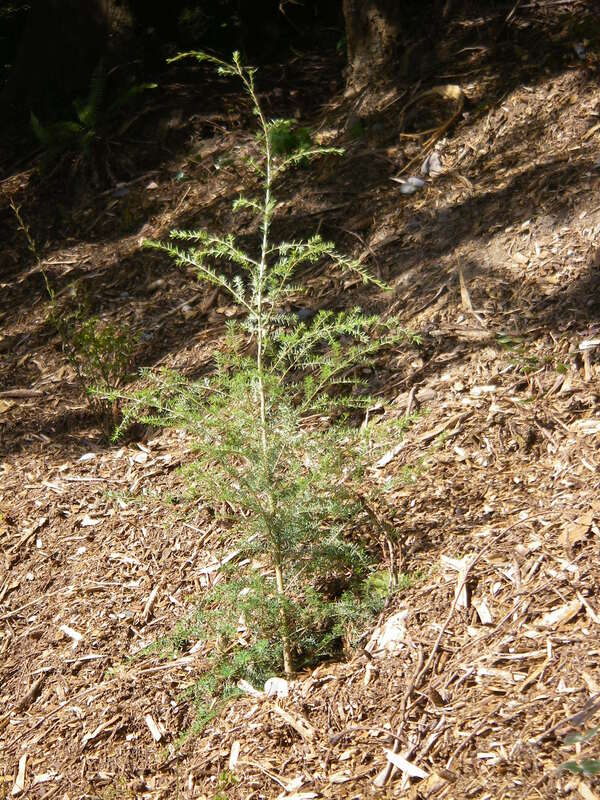 Western Hemlock has been grown successfully in the laboratory using micropropagation techniques. 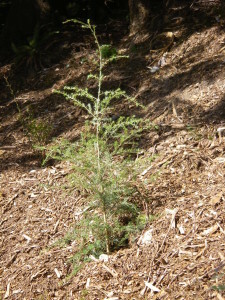 For small quantities, hemlocks may be propagated by layering. 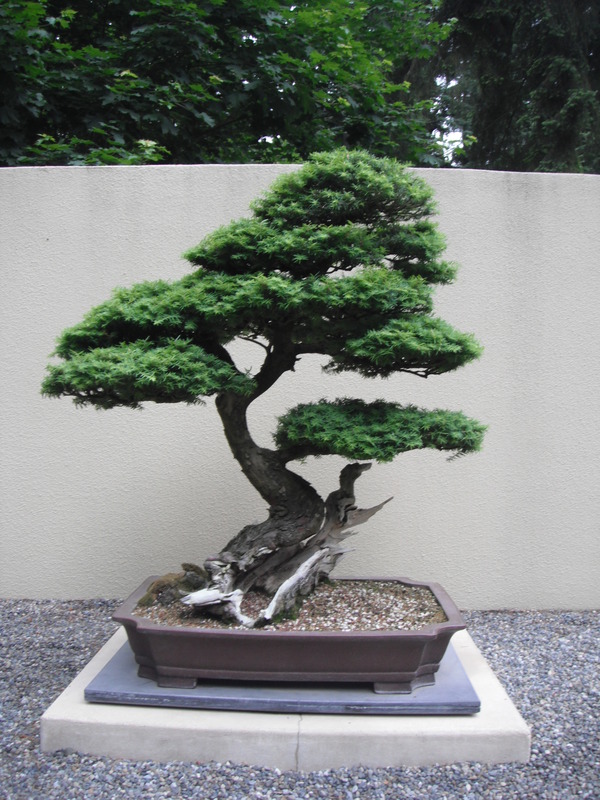 A bonsai of Western Hemlock at the Pacific Rim Bonsai Collection in Federal Way. Use by People: Western Hemlock is the second most important timber tree in the northwest. The lumber is sold as “Hem-Fir” and is used for making treated lumber. It is one of the best pulpwoods for making paper products. It is also a principal source of cellulose fiber used for making cellophane and other products. Natives mostly used the wood for firewood. Young trees and saplings were used for poles and fish traps. The bark was used to make a reddish brown dye or paint and as a tanning agent. The pitch of hemlock was used on the face, cosmetically and to prevent chapping. Use by Wildlife: Hemlocks are favorite nesting trees for many birds. Pine Siskins, Crossbills, Chickadees and Deer Mice eat the seeds. Porcupines and Douglas Squirrels and other mammals also eat the bark. Deer and elk eat the foliage and twigs. 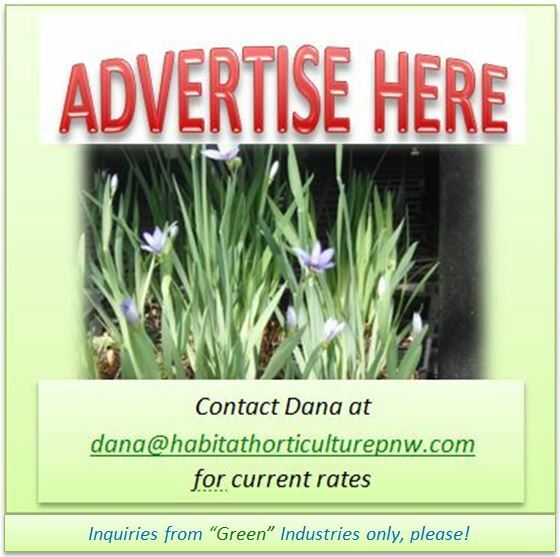 This entry was posted in Conifers on February 3, 2014 by habitatdana.